Groups | Upper Peninsula of Michigan Radio - Yooper News, Interviews, Pictures, and Calendar of Events - Great Lakes Radio, Inc.
Marquette, MI – The monthly meeting of the League of Women Voters of Michigan, Marquette County Member-At-Large State Unit, will be held on Wednesday, April 3rd from 6:00 pm to 7:30 pm. The LWV is a nonpartisan political organization that encourages informed and active participation in government, works to increase understanding of major public policy issues, and influences public policy through education and advocacy. Meetings are held at Peter White Public Library, lower level, Studio 1. The public is welcome to attend this and all monthly meetings. For further information, email dthompsona@gmail.com. Use of Studio 1 is made possible thanks to the support of the City of Marquette, Michigan Council for Arts and Cultural Affairs, and the National Endowment for the Arts. Marquette, MI – Blue Birch is on Wednesdays in April (3rd, 10th, 17th, 24th) from 1:00 pm-2:00 pm in the Peter White Public Library Great Room. The program is a reading and book club for ages 8 and up. Be exposed to new stories, new activities, and enjoy time with your friends. For more information call 226-4323, visit www.pwpl.info or find Peter White Public Library Youth Services on Facebook. Marquette, MI – The 2nd Annual Upper Peninsula Beekeeping Conference is dedicated to the special challenges of keeping bees in Northern climates. Designed specifically for fellow beekeepers, this educationally packed day includes practical beekeeping information from keynote speaker, Mike Conner, as well as various breakout sessions. Vendors will also be on site to meet the beekeeping equipment needs of attendees. A complimentary lunch will be provided by Simply Superior at Northern Michigan University. The conference will take place at the Seaborg Center at Northern Michigan University on Saturday, March 30th beginning at 8:00 am. Registration is open now. For more information, please visit Facebook or Upper Peninsula Beekeeping Conference. Marquette, MI – Everyone raise a cookie during National Girl Scout Week, March 10-16! The Girl Scouts’ 107th Birthday was on March 12. Happy Birthday to this vital organization. 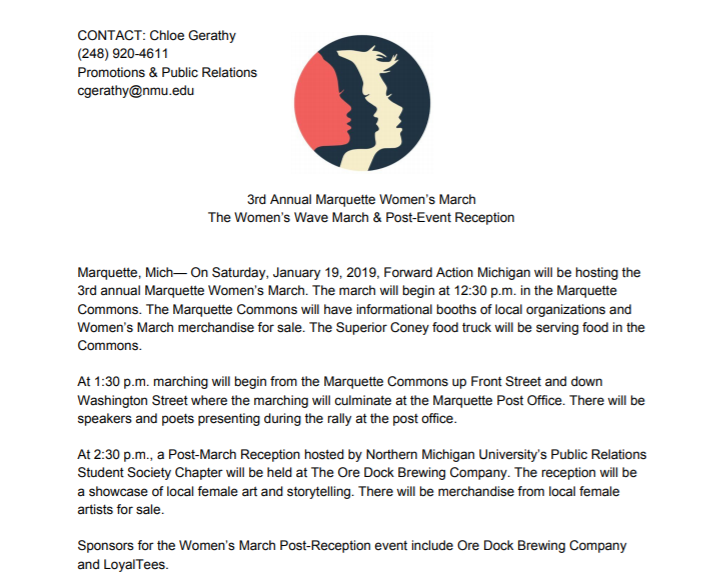 Marquette, MI – The 3rd Annual Marquette Women’s March will take place on Saturday, January 19th beginning at 12:30 pm in the Marquette Commons. More information is pictured below.